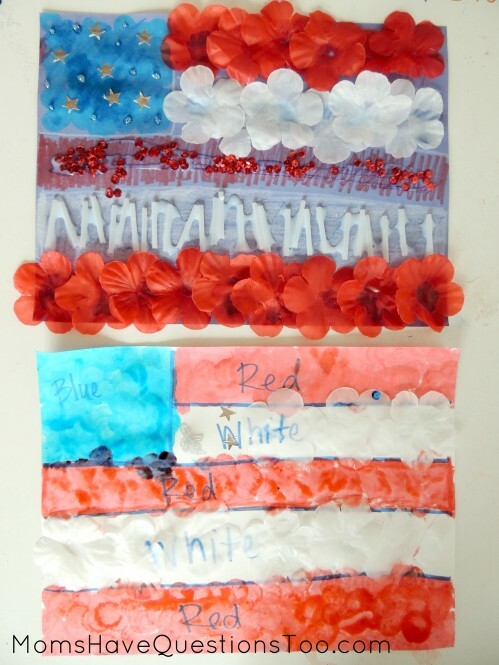 What’s a fun flag craft my kids can do for Independence Day? My kids are loving collages at the moment. I think they just love to glue things. Since I had so many extra red, white, and blue items left over from our 4th of July banner, I thought we should use them for a flag collage. 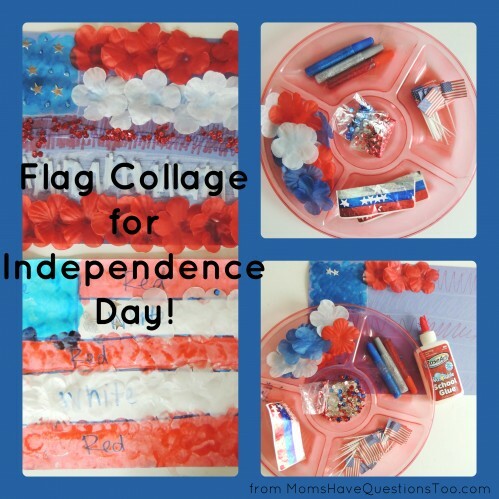 Gather red, white, and blue items to use for the collage. Scroll down for a complete list of the items I used plus even more ideas. Draw a simple flag outline on a piece of construction paper. 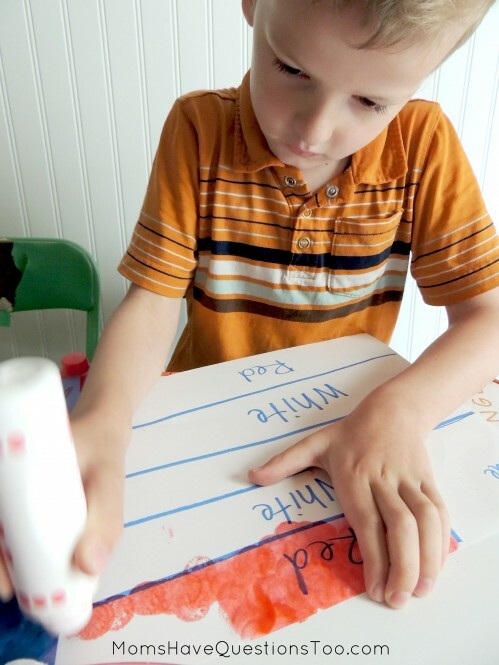 For younger children, use crayons to quickly color each section so your child knows what color that section should be. For older children, write the color each section should be. 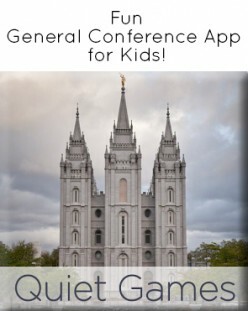 For even older children, just leave it blank. You can see that for Smiley Man, I used crayons to color the different sections. For Little Bear I wrote the names of the colors and I wrote them all with one color of marker. 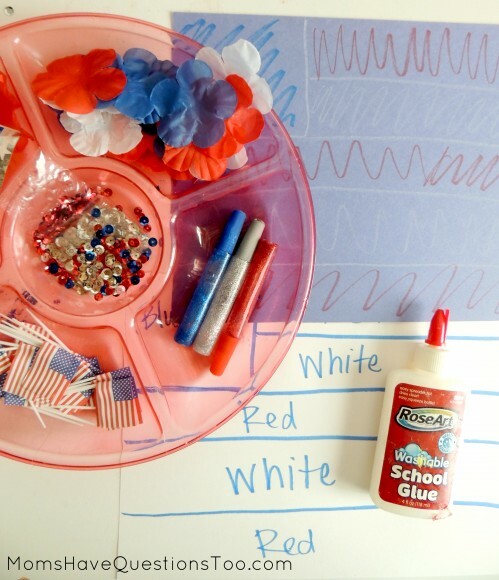 Have your child use the red, white, and blue items to decorate their flag however they want. Little Bear decorated his flag with do-a-dot markers and white flowers. Smiley Man got sick of the activity after 2 seconds, so I finished his for him. Haha! He is getting more defiant these days, but since this project was just for fun, I didn’t push it. Let flag dry completely and display as desired.